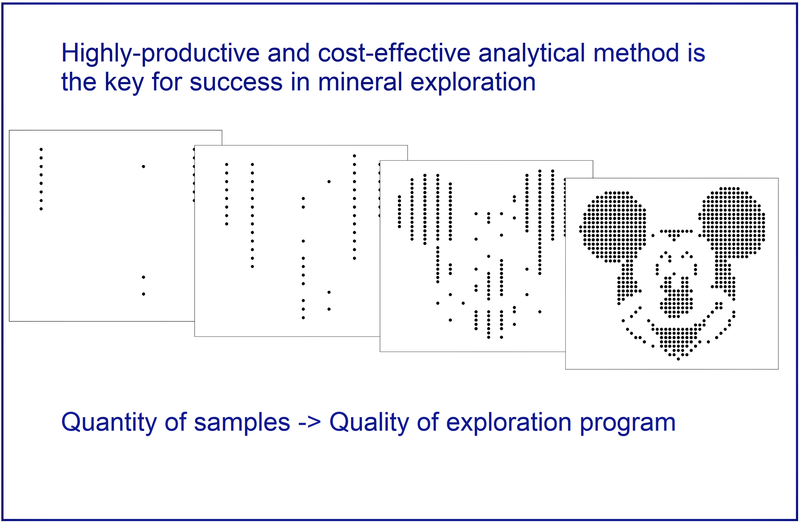 Efficiency of early stage mineral exploration depends on the number of analyzed geochemical samples. The number of samples collected could be up to 10000 samples per month for one exploration target. During base metal exploration, portable XRF analyzers prove to be the most effective method of generating quick and accurate analysis, but XRF do not detect gold and many other elements at the levels required in prospecting geochemistry. 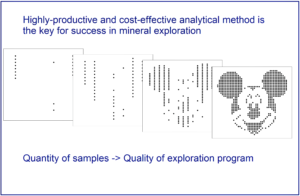 A solution could be the development of an effective geochemical survey method based on simple and productive sampling technique and analytical methodology with acceptable detection limits for elements, that cannot be detected by portable/mobile XRF analyzers, and with high production rates. Sample preparation should be simple and should exclude chemical dissolution of samples. Using analytical complexes should be reliable, easy to set up and maintain and affordable for junior exploration companies. Therefore we developed original methodology based on our own invention – MEFFA – Multi-Element Fine Fraction Analysis.